Knock your shopping list out before Thanksgiving! 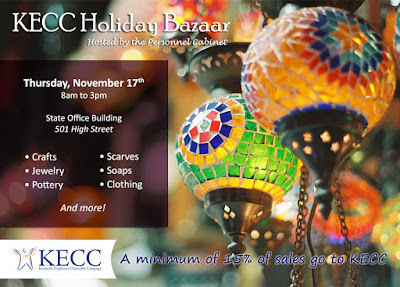 Holiday party decorations to cherished gifts, the Personnel Cabinet KECC Holiday Bazaar has it all. Shop for a cause this Thursday, Nov. 17th. Join us at the State Office Building (501 High Street) from 8am to 3pm to check a few items of your holiday to-do list. Minimum 15% of proceeds will benefit KECC!